Cabo San Lucas, Los Cabos, Baja California Sur. 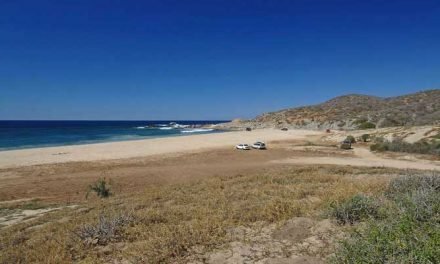 Medano Beach or Playa el Médano is the main safe swimming beach in Cabo San Lucas and the most popular. 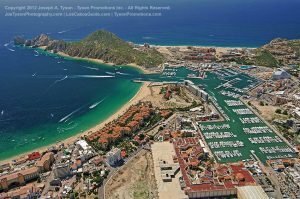 It begins at the east side of the harbor and extends along Cabo San Lucas Bay all the way to Villa del Palmar. 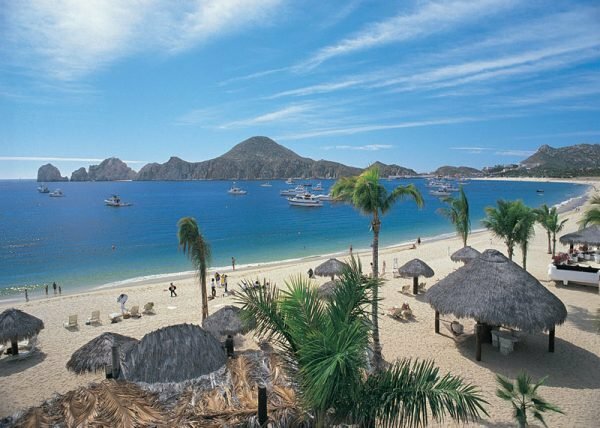 Medano Beach or Playa El Médano is the All-Round Best Cabo San Lucas Beach. 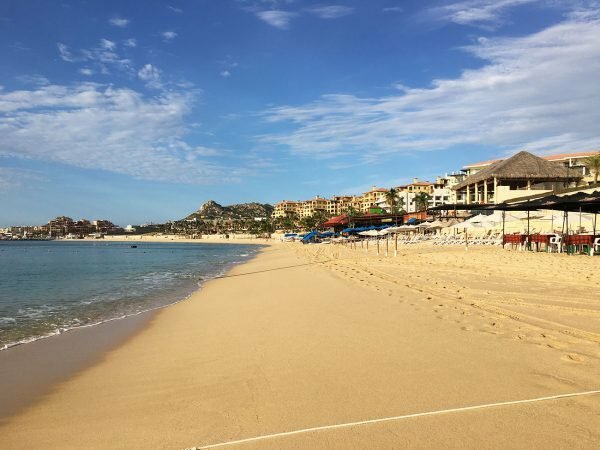 Why: Médano is king of the Cabo San Lucas beach scene: two miles of golden sand bounded by shops, restaurants, palapa-topped cantinas, and seaside luxury resorts. It is, thus, the center of the local social scene and the best place to find water-based rentals like kayaks and wave runners or to arrange adrenaline-racing adventures like flyboarding or parasailing. Médano reaches its peak of popularity during spring break, but it’s packed on a year-round basis with bikini- and board shorts-clad revelers. When: This is the only beach in Los Cabos to double as a nightlife destination, with live music, fiestas, and fireworks displays on a regular basis. Come day or night. Where: Médano Beach is accessible from the marina boardwalk or from Paseo de la Marina in Cabo San Lucas. 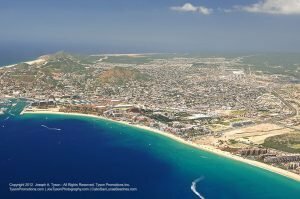 Aerial view of Medano Beach and town, Cabo, September 2012. Médano Beach (Playa el Médano) Cabo San Lucas’s most swimmable beach is also its most popular stretch of sand and the most accessible. Located near the heart of Cabo San Lucas, Médano boasts more amenities—restaurants, beach clubs, activities companies, and spas, among them—than any other you’ll find in Los Cabos. Come here for an early morning horseback ride or stroll then stick around for breakfast at Baja Cantina (www.bajacantinabeach club.com), lunch at Mango Deck (www.mangodeckcabo.com), and plenty of fun in the sand. Médano is located just off the main highway at Paseo del Pescador or Paseo de la Marina in Cabo San Lucas. Above excerpt from Los Cabos Magazine Issue 35, Winter 2013-2014. El Médano ( The Dune ) is Cabo’s main beach, and is a great place to hang out with an outstanding view of Land’s End from any vantage point. Stretching two miles from the marina entrance to Villa del Palmar, El Médano is the best place to swim in Cabo San Lucas. Packed with restaurant-bars in the sand, you’ll find beach volleyball, high-powered Jet Skis and Wave Runners, kayaks, small catamarans, sailboats, ski boats, boogie boarding, and parasailing. Snorkeling and dive trips to sites near El Arco are easily arranged. Playa el Médano Cabo San Lucas 1990. Not a beach for those looking for privacy, El Médano is known for all-day happy hours, people watching, and plenty of beach vendors. For fewer crowds, walk northeast towards Club Cascadas and Villa del Palmar. With plenty to do and little surf year round, this beach is highly recommended for families. Swimming areas are roped off along the beach. 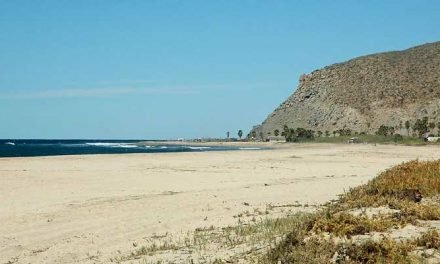 Playa El Medano or The Dune Beach, encompasses several miles of safe swimming beach beginning at the east side of the harbor entrance all the way to Villa del Palmar on the east end of the bay. Close to town, Playa El Médano or Medano Beach is the main and most popular Cabo San Lucas Beach. Here, hotels, bars and restaurants compete for space, offering all the goodies most people come to expect from a prime tourist destination. Whether you choose an activity such as swimming, jet skiing, kayaking, waterskiing, banana boating, parasailing and volleyball or just want to hang out and enjoy the beach parties, you’re sure to have a good time here. Medano Beach, nearest to town, is also prime sales territory for the ubiquitous vendors who will continuously interrupt your siesta with offerings of everything from Chicklets to blankets, sombreros, temporary tattoos, hair braiding, and silver jewelry. 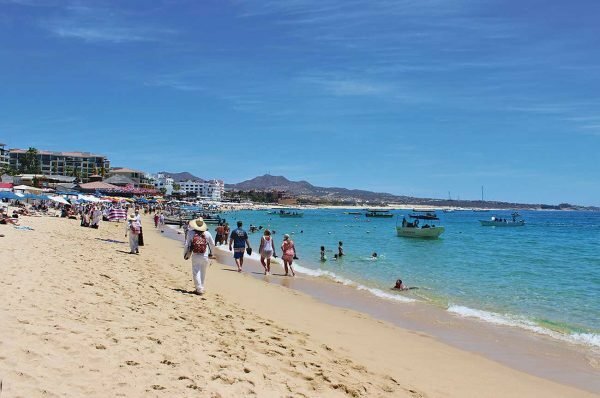 Don’t misunderstand me, Medano Beach, Playa El Médano, is a blast—it’s where the action is and is close to downtown Cabo San Lucas — a true destination beach for the young at heart. It is the place to see and be seen, where the party continues all day and into the night. Medano Beach does not necessarily offer the tranquility of Santa Maria or Palmilla Beach but that’s what makes the beaches of Los Cabos so unique—there is a special place for everyone. Play volleyball, throw a frisbee with friends, or build a sandcastle with the kids—come and enjoy.destination.